Random Blog Post?! Test | "Just walk with me.."
Hi Everyone.. HERE’S A LINK to a random old blog post. -this is an experiment! See side bar and share with us what you think! 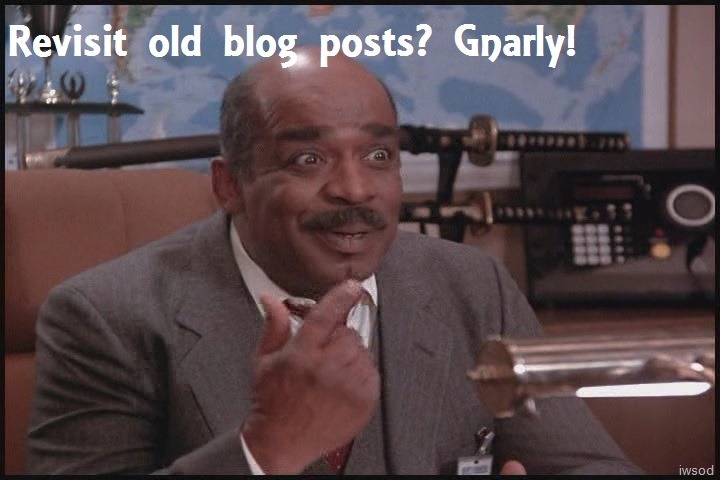 There use to be a random post button on wordpress but it seems to have vanished..
Want me to make it a random episode? i.e. so it’s a mini walk through? Or pluck a completely random post out of the walk? Or toss this idea completely? Or I can stick an old post to the top of the home page- which I have done now to show you what it’s like. Freely let me know which you prefer.. Bye for now! This entry was posted in General SMK. Bookmark the permalink. I often pick a random episode to “walk through” again, so if you are picking one, I won’t have to decide ! Maybe I will make some more comments, although I rarely have the insight of the regular posters ! Great to hear from you again, SilverCorvette. Yes, some regulars are very insightful but I don’t pretend to be and don’t let it stop me 😉 . Please comment away! This is such a fun idea – it’s like dipping into the DVDs when you have a spare hour. And for such a funny bit to show up as the first one is like icing on the cake. Ah, early SMK I do miss the humor! Even sometimes cranky Lee can make me chuckle, like in the casino scene. I like the random random blog post. Oh true!!! yes I enjoy the chance to revisit some early smk humour!! But.. which way to go? Which format.. the actual post? or the link post? There’s pros and cons for either.. I think I kinda like the Random Blog Post where we don’t know which old post it is until we click on it. I love that look of Billy’s. But it doesn’t really matter. Hiya – thanks BJo for sharing your opinion! I can see pros and cons for either option – with the random blog post link – it is fun to click on the link and then discover what it is.. However, you won’t know until you click on the link if Iwsod has changed the random blog post or not! I’m guessing this could be a bit annoying if I’m delayed a few days.. and I can’t even say a time because we are all on different time zones. sticking the full post on the home page is the simplest and easiest way – I just have to click one button and its done! But .. is having a big post stuck to the top permanently irritating? or.. is it just a matter of getting use to the home page looking like that? Honestly, I very rarely go to the home page. I have it where it just shows a link to the next commentary when it’s next. lol – I think I misunderstood the question. I thought that the Random Blog Post would appear only when there was a new link. I didn’t think it would be a permanent fixture at the top of the page. You’re right, that would get annoying rather quickly! When you said home page I thought you meant the Home tab at the very top right next to About. Me confused…. Yeah I can see I didn’t make that clear! It would need to be one static post that is regularly updated or if there is a new post daily very quickly the blog would fill up with these types of posts.. and it would disrupt the flow of the walk. Sooooo we just have to come up with a way to avoid the annoying link clicking to find it hasn’t been changed.. The next day I can edit it to say ‘here’s Tuesday’s link’ – and change the hyperlink to a new random post..
That way – regardless of where you are in the world, and what day it actually is (LOL) you will know the random post link has been updated because I’ve changed the day of the link. Okay? Are we happy with this? Enjoy discussing the extra long new post (R.I.P Lee!! wha???!!!) and I’ll look forward to getting back here early next week. Learjet and BJo – can one of you keep one eye on the blog please? have a great weekend everyone and I’ll be back early next week! True.. it would be one less thing I need to do daily! we’ll start with MWF.. good idea! Thanks BJo! I had a fabulous weekend catching up with friends.. but of course have paid the price and come back to much work to do.. eek! maybe I can aim to publish walk posts Tuesday and Thursday..
and update the random blog post link on Mondays, Wednesdays and Fridays.. err roughly (due to time differences this won’t be exact but I refuse to bother worrying about it haaaa) bye guys! I had a thought about this. I really don’t have much experience with WordPress, but I wondered if you could put the random blog post in another tab? (i.e., like “Topical SMK”)? Then just change the link to a different post page anytime you want to use that and send that page to our emails? Then it’s not on the main page, but it links the old pages. It would have to be updated with a different link each time. Would that work? You sent us Topical SMK recently, so I thought this could also work as its own page. Hiya Sara, what a great idea! The only concern I have with that is that I don’t want to random post to be tucked away where people won’t see it.. It would be great if small groups of us were reading the previous posts – so if someone comments on it there will be others reading the same blog post kind of thing.. does that make sense? I think a small post stuck to the home page is going to work best.. Thanks so much for the suggestions Sara and everyone! And thanks also for the feedback that you enjoyed the idea! This is a great idea, Iwsod! and hopefully will feed our JWWM obsession while giving you a bit more breathing room. Nice that you linked to Lee-tux post! Always a good move in my books. I’ll be back to leave feedback when I have a chance to ponder….. If I’ve thoroughly confused you – please feel free to let me know if this isn’t making sense. .bye everyone – it’s off to work for me!